This weekend our team got split up and played at the shelter and at The Chambers. This debrief is about our game at the chambers with four players: FP05,FP16,FP44,FP29. The day started of great, we had great weather for starters and I felt it was going to be a promising day. 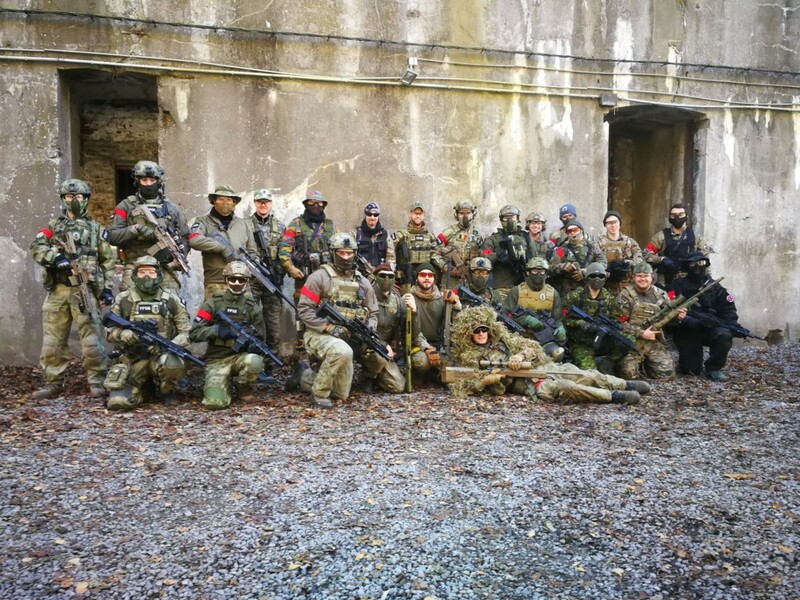 However when we arrived at the briefing we quickly realized that it would be a crowded day, this because of a famous youtuber/airsofter (Kicking Mustang) from the UK came over so that might be why we had over 150 players joining the game. The missions that day were :Find fuel cans secure dynamite and destroy the enemy stronghold with it (rooftop). I was lucky to have great team members on my side and together with the great weather it was an awesome day! 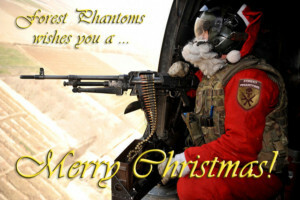 Seasons greetings from the Forest Phantoms! 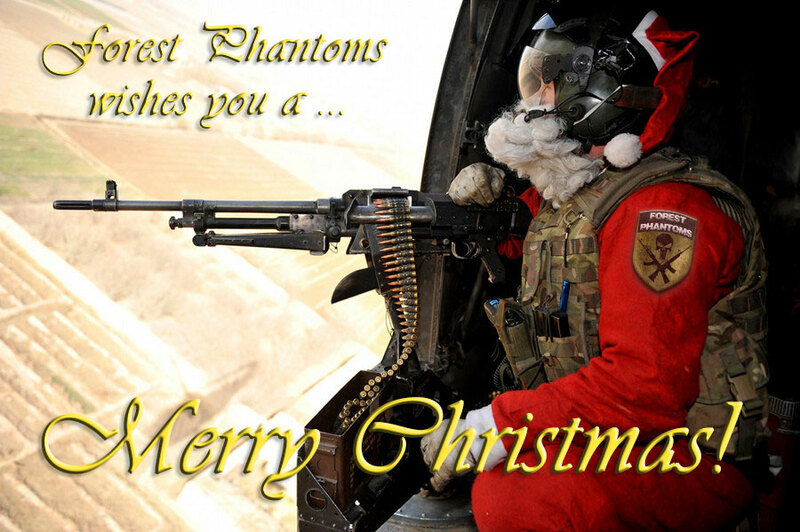 We wish you a Merry Christmas and a happy and skirm-filled new year! Hi Guys, as an overview to a great airsoft year, check out our latest clip! Today was the first time we had a game at Fort Barchon. A few of our members (FP06 included) already had some experience, but all in all this was a first time. Luckily for us, 24 (!!!) FP members showed up. We likely made up more than 1/4th of the people at Barchon that day. The game started with a team death-match where you had to roam around the map and collect all balloons. Starting off, we divided our squad in 2 parts. One part would stay outside, and one side would enter the fortress complex and try to get behind enemy lines. The signal was given and we rushed to the fort entrance. Once inside, it became clear that team blue was already inside. We made short work of them using our rifles and grenades and rushed on. The deeper we got into the fortress, the more cut-off we became. At some point we reached an underground raft with a large staircase behind it. Silent as a grave we went up the stairs. Once we reached the top, we started picking up some noises around the corner. Multiple enemies where meters away. Out came the TRMR’s! While many enemies where killed, they had grenades of their own. New years eve was early this year as the fireworks burst all around us. Myself, FP02 and FP06 managed to break away in a rush to the left tunnel. After a quick roam we came up on the other end of the fortress only to our surprise, most of the enemy force was coming in fast to our location. Back into the tunnels. After some small skirmishes and taking out some more players, we got hit and had to go back to the spawn location. The other squad was firmly in position but most of the balloons where already captured by team red. After some more fighting, the game ended and red took the lead. Second half of the day, the mission wat to collect 5 red flags. We started on the other side of the map. Tactic changed and we kept most of the team together to fight as a bulk force. This time we went up the staircase that brought us on the middle ridge and the bridge. Instead of rushing forward, we went around the back of the map to come up closer to the enemy spawn location. While we took point, we got word that our rear flank was taking fire. Myself, Maarten and FP13 decided to head back to reinforce our team. When we arrived, the bridge was again under fire by team blue. About 5 players had taken point overlooking the road below and firing freely at team red. We snuck up on them and rotated our fire and reloading. This put a continues stream of rounds on the other team, and after the first 3 guys got shot, the rest tried to retreat and got shot as well. No escaping FP. After that we stuck around for a while to ensure the area was safe. After 3 waves of team blue players trying to gain more ground, they gave up. We headed back to our team that was still laying fire on the enemy flank from above. Soon after, it was clear red was taking point at all strategic area’s of the map. We went back down and after lots of skirmishes on the road we managed to guard 3 blue flags. On to the last remaining red flag on the field. It was located in the middle of the road right in front of the lunch area. A LOT of fire was exchanged, including pyro’s. After some back and forth, FP13 managed to pull free and claimed the last flag. This ended the day as we now successfully managed to collect all flags. All in all great work from team FP! Our new members performed great. It’s good to see some fresh blood that is willing to do their part. Looking forward to having your support out on the field. I also look forward to playing at the chambers again. Barchon is a fun change of pace, however due to the many chokepoints it is difficult to flank and use tactics. Posted in News	| Comments Off on How to organize your gear.